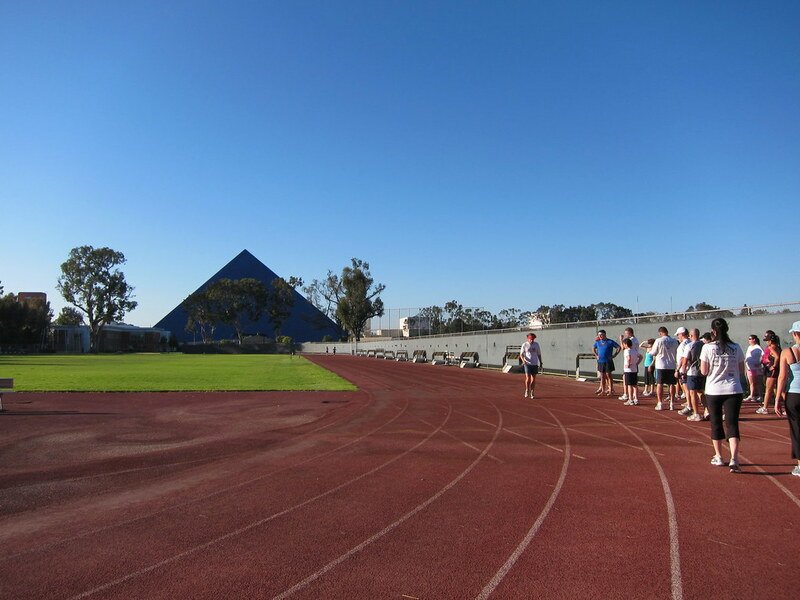 Last night, the Green Girl attended her very first Sole Runners track workout at Long Beach State. I was really reluctant to attend because I haven't had good experiences with speed training but at the last minute, I decided to go. I also hesitated because of the scorching sun but something inside me told me I should give it a try. 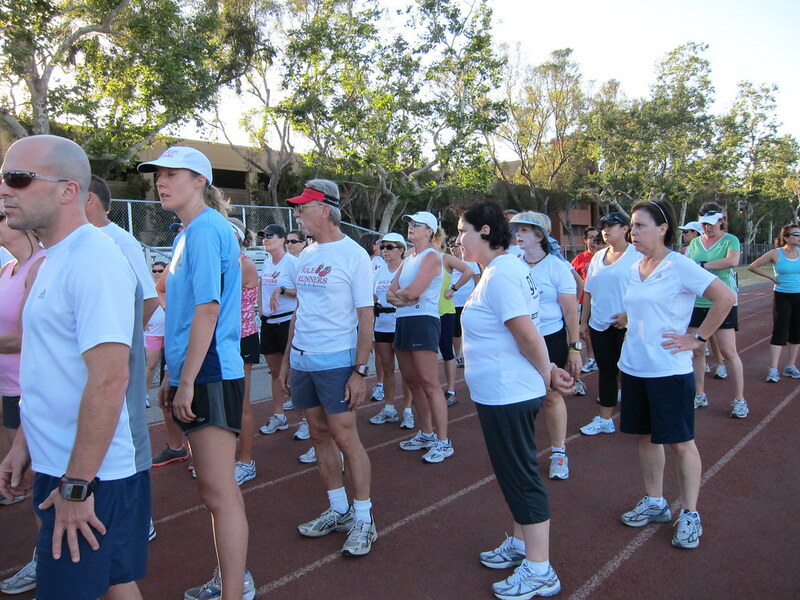 We started off with our ChiRunning body looseners and then Coach Steve had us run three easy laps around the track. I struggled to run at about a 13:30 pace in the heat. Once we were warmed up, he had us do some 100 meter drills. We did skipping, high knees, heel kicks, and crossovers. I refrained from participating in the crossovers because I am terrified I might sprain my right ankle again. After we were thoroughly exhausted from the drills, we walked a lap and then Coach Steve instructed us to run a lap as fast as we could and then walk about 50 meters out and 50 meters back to the start to start the process all over again. I started out running as fast as my little body could. I was huffing and puffing immediately. I looked down at Mr. Green Garmin and he told me I was doing a 7:50 minute mile. 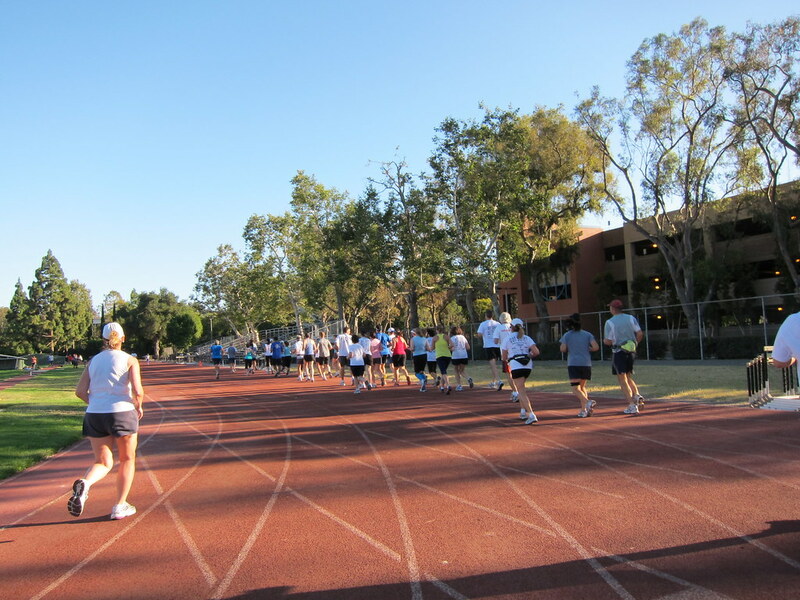 Gasping for breath, I slowed down to 8:00 but all that speed upset my stomach and I had to stop before I puked all over the Long Beach State track. There was no way I could maintain that speed over 400 meters. After that, I slowed down significantly and walked a lot. I was grateful as the temperature decreased and an occasional breeze wafted through. It finally came time for our cool-down of two easy laps. My stomach had settled at this point so I joined the group and was able to maintain a 10:30 pace. Coach Steve commented that I had gotten a second wind and I laughed and explained to him how I'd gone out way too fast on that very first lap. 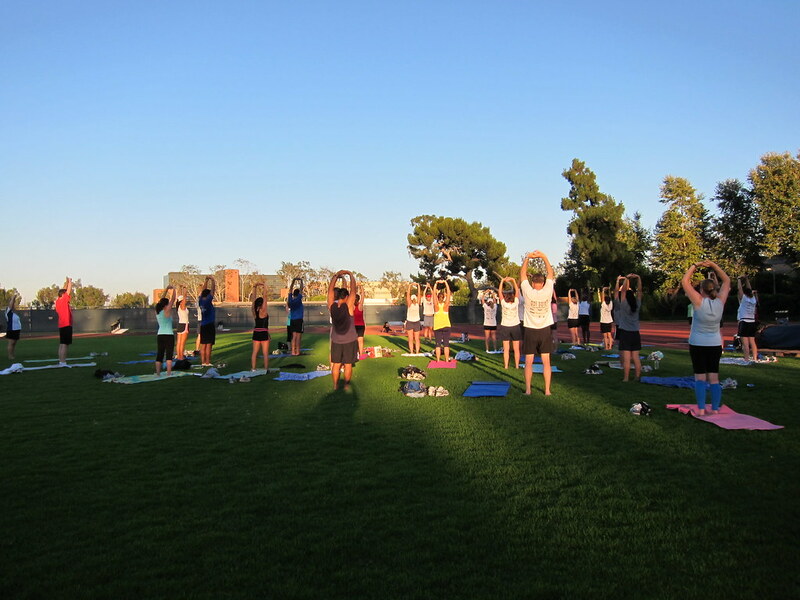 We finished with Coach Steve leading our post-run yoga in the grassy area in the middle of the track as the sunset cast shadows over our mats. The grass was plush so the ground was soft beneath our yoga mats. I was pleased to see some improvement in my pose transitions. I also focused on keeping my wrists straighter when I did downward dog. I wore a brand new pair of New Balance 1012's to break them in before San Francisco. 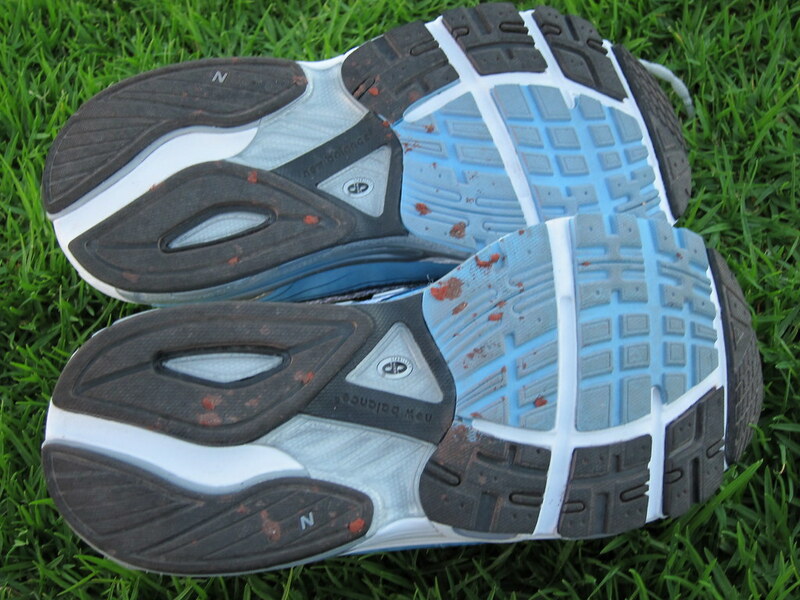 After the run, there were little bits of the dark red track material stuck to the sole. For the first time in my life, I felt satisfaction instead of frustration after speed work. I'm glad I gave the Sole Runners track workout a try. Thanks, girl. I was really adverse to the idea but I'm glad I gave it another try. When I did speed training before, we'd run about five miles prior to the drills and it frustrated me that by the time I got to the track, everyone else was well into the exercises because I was so much slower than them. I wanted to attend but with my recent knee injury that took almost 2 weeks to heal I was scared it would resurface. Sounds like it was very productive. Hopefully next time I will make it. Congrats on such a positive speed work session! I am glad it treated you well! You showed it who's boss! That is awesome! Someday I am going to try something like that. Running with other people sounds like fun. Repeat after me: Track workouts are my friend!!! Keep them up Greenie, you'll feel better and better with each workout and they're so good for you! So glad you gave it a try...and what a legendary place to run - so cool! Great track workout! I<3 the track! Thank you, Middle Name Marie! TheLovelyNancy, I can understand your reluctance - I have the same fear of re-injuring myself doing speed work. I hope your knee continues to heal and I hope to see you out there on the track soon. Thank you, Rad Runner Girl and Heather. Doing speed work in a group is definitely more fun than doing it solo. Jill and Teamarcia, I can only hope that after time I am as enthusiastic as you girls about track workouts! I'll be there as well. Good luck! Wow, I'm really impressed. Speed is something I never do. I know I should, but I'm not running anything for time and don't know if it would really be worth it. Doing speed work for an ultra in the mountains...? Not me. You really did great. un-Zen, I'll be sure to graph and pie-chart the number of children grouped by age that beat me. Best of luck to you next weekend! Johann, thanks for the kind words. I didn't 'Green Girl' and 'speed' would ever be in the same sentence but I gave it a try. Love2Mags, I really enjoy running with a group - I ran by myself for just under a year and I've been running with a group ever since. I guess I like that I have the option to go solo or join the gang. Nice workout Mary! I'm with Jill on track workouts. By the way - I hear you and RadRunner are ditching us for burritos Saturday night before SF? Rad is saying the burritos are to die for? Where? I'll need to stop on Sunday after the race! Yeah, Rad Runner Girl has her heart set on the burritos at Papalote Mexican Grill. We're always so focused on distance that we rarely focus on other factors.